Why does my slideout room keep moving even when I release the switch? Last year they worked fine, now when I release the switch I hear a motor spinning and the room keeps moving. Is there trouble with the solenoid switch on the motor? John, with such a plethora of slideout mechanisms found today, it depends solely on the actual design of the slide mechanism. But if the problem is not evident with every slideout on the motorhome, chances are it’s an individual stop mechanism out of adjustment. I doubt it would be the activating solenoid since the rooms do indeed slide in and out. Rather, it sounds more like a micro switch is out of position for that particular room. Keep in mind; this is just an educated guess made without knowing the actual make and model of the slide assembly. 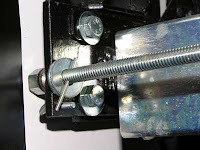 There are some adjustments that can be performed by the RVer as long as the manufacturer provided the troubleshooting literature. If you have doubts about tackling this yourself, or if you do not have thorough troubleshooting documentation, contact the manufacturer of the slide mechanism, (not the coach maker), and ask for a referral. They all will have a list of dealers and service facilities familiar with their products. Once you find a service facility in your geographical area, I would call ahead to be sure that shop employs technicians experienced with that make of slideout.